Fleetwood boss Steven Pressley says he has had sleepless nights during the relegation run-in but is looking forward to tomorrow’s game against Crewe and hopefully complete the job he set out to do when he arrived – keeping Town in League One. When Pressley took over the reins from Graham Alexander in October Town were in the relegation zone. Now they teeter just above it with either Town or Blackpool set to be relegated come 2.30pm tomorrow. Town have a two-point cushion from ‘Pool and just need a point from relegated Crewe at Highbury to seal survival. And Pressley is confident Town will beat the drop. He said: “I think any manager that tells you they enjoy it would be lying because it is not enjoyable. “It is tough, it is difficult, there is a lot of reflection and sleepless nights but you have to remain strong and remain determined. We need to look at this as there will be sunshine beyond the gloom. “You need to get through difficult periods to eventually get to where you want to be. “Life is not easy but we can do nothing about the past we can only influence now. “We had a good session yesterday, a session where we tried to lift a little bit of the gloom. It is a difficult period. “But I’ve never lost that determination, I’ve never lost that belief. I’m really looking forward to the game. But Pressley is not expecting Crewe boss Steve Davis to show any nepotism towards his son Joe’s teams plight by letting his side roll over and help Fleetwood. 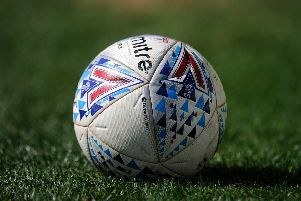 Crewe did Town a favour by beating Doncaster 3-1 last Saturday and putting the final nail in Rovers’ coffin despite a slim slither of sunlight. Davis senior said he is surprised Pressley’s men are in the relegation mix. And Pressey says they need to prove they are worthy of staying in the division. He said: “I said to Joe after the results came through last weekend that his father must have given a Winston Churchill speech prior to the game and could he get me the words! “We joke with Joe all the time but I know Steve Davis and he is a very professional man. Crewe are playing without fear, they are playing with freedom and energy, they have quite a young team. “So I think the shackles have come off and credit to Steve for keeping them focused on the job in hand. “We find ourselves in a situation where people will say you are too good a team but that is wrong. You go down if you deserve to go down and we have to ensure that is not the case. Pressley will have someone telling him what is going on during Blackpool’s game at Peterborough. He said: “If we win we are safe so regardless of the result elsewhere if we are winning we will stay in the league. “But I want to be made aware because if I need to make any changes at any given time regardless of circumstances elsewhere that might be the case.